It happened again. On the last day of my recent trip to the Pacific Northwest I experienced something I’ve written about before. I once again went out photographing with high hopes of capturing a certain image that did not materialize but in the end got something better. 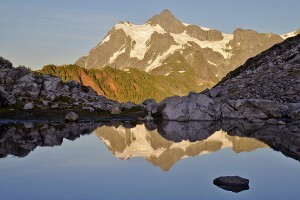 Mount Shuksan reflecting in Picture Lake is one of the most iconic images in Washington State. I so hoped to capture my own stunning image of this well-known scene, even if it did involve a three hour drive to get it. My friend, Mike, and I made the trip up to Picture Lake. When we got there I just knew that I was going to get the iconic image I had seen so often. The lake was there. The mountain was there. Even the light was good. Nothing stood in the way of getting my picture. Or so I thought. When we got down to the lakeshore it became apparent that the wind was blowing just enough to prohibit a good reflection. I kept thinking that the breeze would calm down but after an hour and a half it had not. Needless to say I was disappointed that we had come all that way and I was not going to get the image I coveted. We decided to drive on up to Artist Point. 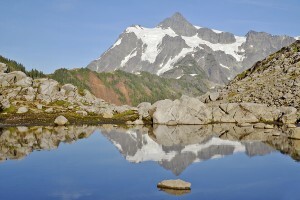 From this area you have great views of both Mount Shuksan and Mount Baker. I spent an hour or so taking pictures of both mountains but just could not release my disappointment of failing to get “the shot” I had wanted down below. Later I started walking around the trails in the area and found one that led slightly uphill and followed it. It wasn’t long before I came upon a sheltered pool that had formed from the thawing of snow in the area. 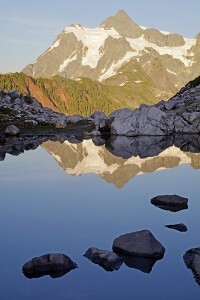 From the trail it did not look like much but I had a hunch that if I walked down to the pool and got low there might be some nice reflections of Mount Shuksan. I was right. The scene was utterly spectacular. I spent the next hour and a half photographing beautiful reflections. I did not get the image I had originally come for but now believe that what I got was something better. 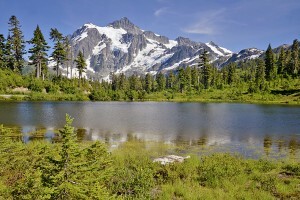 Thousands of other photographers had captured the image at Picture Lake. I suspect very few had photographed the small pool I found on the top of the hill. So once again I was reminded of a very important life lesson. Sometimes we do not get what we want but God often has a way of giving us something even better . Our disappointments in life may well become a prelude to something wonderful and good. I offer two further reflections on my experience that evening. First, wanting what everybody else has can be a dangerous game. There is a good reason “Thou shalt not covet” is one of the Ten Commandments. (Ex. 20:17) Wanting what someone else has–be it an iconic image, a certain vehicle, watch or television–can lead to a great deal of frustration, disappointment and unhappiness. Furthermore, by focusing on getting what everybody else has we may not leave ourselves open to receving something better. I tend to believe that God has more to offer us than just the status quo. Second, I was reminded that evening that to receive some of God’s blessings we have to be willing to get low. Just as I could not have gotten the images I did without getting very low to the ground I truly believe that unless we are willing to humble ourselves and “get low” that it is very unlikely that we will experience the best God has to offer. When we are full of ourselves we are not in a position to be receptive and therefore may well miss out on the blessings God wants to give us. So I suggest that we learn to let go and stay low. By letting go of the necessity to have what everyone else does and staying humble we are far more likely to find peace and contentment. God will likely bless us with much more than this but even if He does not these are two valuable treasures we can give thanks for and two treasures most people are still searching for. This entry was posted on Sunday, September 1st, 2013 at 1:26 pmand is filed under . You can follow any responses to this entry through the RSS 2.0 feed. Both comments and pings are currently closed.